What Do Heroes Look Like? What does a hero look like? As children, we think of capes and masks and super-human strength. Our favorite super-being might still be invincible while hiding his or her identity disguised as an ordinary person, but things never get real until the spandex suit comes out. In real life, however, heroes don’t need to hide themselves. They already look just like the rest of us. Whether we realize it or not, every one of us has probably shaken hands with a hero. We’re often unaware because the bravest among us too rarely have their actions brought to light. Earlier this week, President Trump recognized an ordinary hero when he awarded the Medal of Honor to Captain Gary M. (Mike) Rose, USA (ret). In December 1861, Senator James W. Grimes of Iowa introduced a bill to recognize “…petty officers, seaman, landsmen and marines as shall distinguish themselves by their gallantry in action and other seamanlike qualities during the [Civil War].” The new law directed the President to have 200 medals cast. Since the Grimes bill recognized only members of the U.S. Navy and Marine Corps, Senator Henry Wilson of Massachusetts introduced a bill to establish an equivalent award for soldiers in the U.S. Army. After several revisions, President Lincoln signed the bill on July 12, 1862. The final version specified the award’s criteria, saying it would go “…to such non-commissioned officers and privates as shall most distinguish themselves by their gallantry in action, and other soldier-like qualities, during the present insurrection.” 2,000 medals were to be cast for the Army. While the requirements and selection procedures have evolved over the years, the intent to recognize those who risk their own lives in the service of their country and their fellow service members has remained constant. Captain Rose displayed just such extreme valor over a four-day period while serving as a Special Forces medic in Vietnam. Because the mission was classified, his actions have just recently come to light. On September 11, 1970, then-Sergeant Rose’s unit was told to load extra ammunition for their upcoming mission, called Operation Tailwind. Sergeant Rose was instructed to pack as many medical supplies as the unit could transport. A few hours later, the 16 American soldiers and 120 Montagnards (South Vietnamese guerilla fighters) were inserted by helicopter into Laos. Though American forces were forbidden to operate in that country, disrupting the supply line known as the Ho Chi Minh Trail was deemed crucial to the war effort, and the covert mission was approved. The unit came under fire before their boots touched the ground. They were still under fire when they were evacuated four days later. One of the men wounded during the first real skirmish was unable to drag himself back to the American perimeter, so Sergeant Rose ran into the field of fire to retrieve him. According to reports from his fellow soldiers, the sergeant maintained a steady stream of fire with one hand while he dragged the injured soldier to safety with the other. During subsequent engagements, Sergeant Rose had to make his way through heavy enemy fire as he went from man to man, treating injuries. While rescuing another wounded soldier outside the American perimeter, Rose was hit by the shrapnel from a rocket propelled grenade. In addition to wounds on his back and legs, he suffered a more severe injury to his foot. According to Rose, he pulled off his sock and found a hole big enough to stick his thumb through. Since he was the only medic, he put his sock and boot back on, grabbed a stick to use as a crutch, and went back to work. Fortunately, he and the Marine were thrown clear before impact, so Sergeant Rose was able to rush into the burning wreckage to rescue the others before treating their wounds. When the backup ship arrived, Rose was the last man to board. Then, back at the base, he refused treatment until every wounded man had been cared for. Nearly 70 of the 136 men who participated in Operation Tailwind were wounded during those four days. Because of Sergeant Mike Rose, only 3 died. In 1998, a segment of NewsStand: CNN and Time, titled Valley of Death, claimed to tell the story of Operation Tailwind. According to the report, the mission was really designed to take out a group of American defectors who were hiding in Laos. The piece went on to accuse American forces of war crimes, including the use of sarin gas, which is considered a weapon of mass destruction and is outlawed by international treaty. An ensuing internal investigation by the Pentagon concluded the story was false, and both news agencies issued retractions and apologies. After investigations into sources and reporting methods, nearly everyone contributing to the journalistic debacle was either reprimanded, fired, or both. Two of the producers, despite being taken to court over the story, stood by their work. 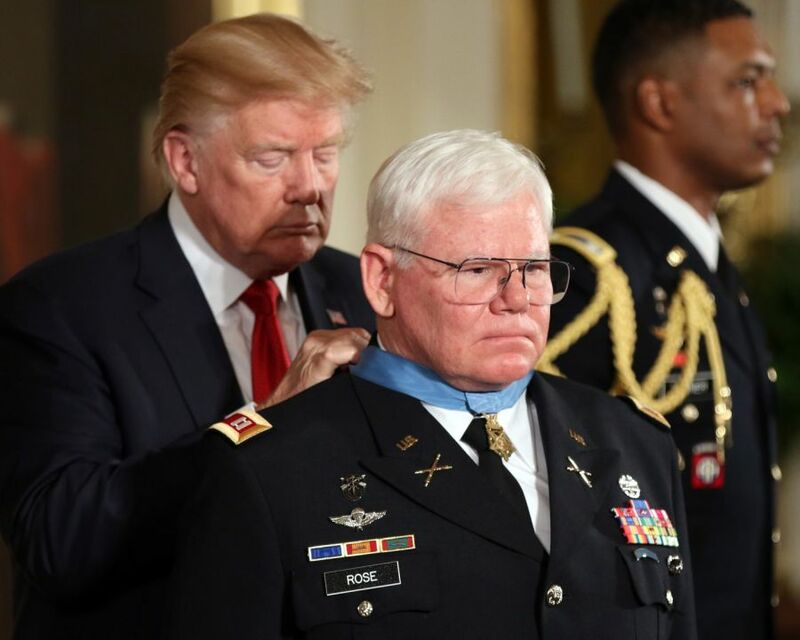 After the fake news story and the de-classification of documents about Operation Tailwind, the Distinguished Service Cross Captain Rose initially received was upgraded to the Medal of Honor. Rose said nearly everyone involved in Operation Tailwind was a hero during those four days, and the award represents the entire unit. After his tour in Vietnam, Sergeant Rose was nominated for Officer Candidate School and commissioned as a 2nd Lieutenant. He retired from the Army in 1987, and started a second career as a manufacturing trainer and instructor. He retired again in 2010. So, what do heroes look like? They look like men and women who went through hell and carried their comrades-in-arms out to the other side. They look like grandparents, husbands and wives, brothers and sisters, sons and daughters. They look just like the rest of us. They don’t wear masks or capes. Sometimes, though, you can recognize one from the blue ribbon around his neck holding an eagle and five-pointed star over his chest. Thank you, Captain Rose, and thank you to every man and woman who has stood in the gap to keep America safe. Previous article“Gender-Fluid” — A Quart Low in the Head!